Our internationally-renowned Guest Artsts visit ECCF for performances and masterclasses, where they work with and inspire our students. We are very happy to welcome them back this summer! Sibbi Bernhardsson began playing violin at the age of 5 in his native Iceland. During his 17-year tenure as a member of the Pacifica Quartet, he performed over 90 concerts a year worldwide in many of the leading concert halls in the United States, Europe, and Japan, including Wigmore Hall, the Vienna Konzerthaus, the Concertgebouw in Amsterdam, and New York’s Alice Tully Hall and Metropolitan Museum of Art. Bernhardsson has performed at festivals including the Edinburgh Festival, Ravinia, Music@Menlo, and the Iceland Art Festival. Collaborations include those with Menahem Pressler, Yo-Yo Ma, Jörg Widmann, the Emerson Quartet, and members of the Guarneri and Cleveland Quartets. He has appeared on television on the Tonight Show, Saturday Night Live, and the MTV Europe Music Awards with award-winning rock artist Björk. Bernhardsson gives regular recitals and master classes in Iceland and in the United States. He has appeared as a soloist with the Iceland Symphony Orchestra and the Reykjavik Chamber Orchestra. His teachers include Gudny Gudmundsdottir, Almita and Roland Vamos, Matias Tacke and Shmuel Ashkenasi. He previously served on the faculty at Indiana University’s Jacobs School of Music and the University of Illinois at Champaign-Urbana. He also was an artist in residence at the Metropolitan Museum of Art. 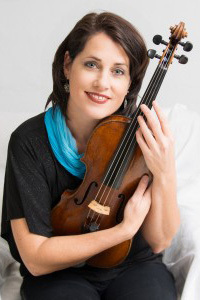 Kathryn Lockwood has been distinguished as a violist of exceptional talents in reviews around the country. The Cleveland Plain Dealer proclaimed, “...Lockwood played the vociferous viola cadenza with mahogany beauty and vivid character.” 2005 marked the release of Kathryn’s solo recital CD of Viola Music by Inessa Zaretsky, “Fireoptics”, which Strad declared “Lockwood is absolutely inside the music's idiom finding appropriate tonal shadings”. Kathryn is a member of the internationally renowned Lark Quartet, and has been guest artist with ensembles such as Trio Solisti, The Muir Quartet, and Triple Helix, and has collaborated with artists Branford Marsalis, Cho-Liang Lin, and the Bill T Jones Dance Company. 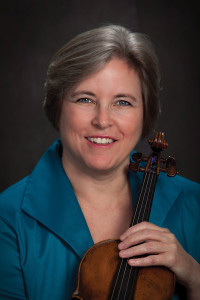 A native of Australia, Kathryn moved to the US in 1991 and captured solo awards at the Primrose International Viola Competition, and The Washington International Competition for Strings. As a founding member of the Pacifica Quartet, she was heard live in residence on National Public Radio's "Performance Today" and on the stages of Carnegie Hall, Alice Tully Hall, and at The Ravinia Festival. She has recorded for Cedille records, including a collaboration with Guarneri String Quartet violist Michael Tree and for Arabesque and Bribie Recordings. Recent faculty positions include University of Massachusetts, Amherst, Boston University Tanglewood Institute, and in the past, Northwestern University, University of Chicago, Interlochen Academy, Music Institute of Chicago, and National Music Camp in Australia. 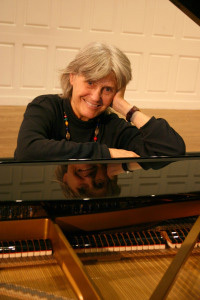 She earned her master's degree with Donald McInnes at the University of Southern California and her Bachelor of Music degree from the Queensland Conservatorium of Music with Elizabeth Morgan. Blair McMillen has established himself as one of the most sought-after and versatile pianists today. 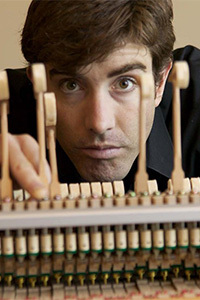 His repertoire spans from late-medieval keyboard manuscripts to the 21st century. Recent performances include solo appearances with the American Symphony Orchestra in Carnegie Hall, the Albany Symphony, Juilliard Orcehstra, Miller Theatre, the Orchestra of St. Luke’s, Caramoor, CalArts, the Institute for Advanced Study, and “Music for the New Century” at ColumbiaUniversity. His first CD “Soundings;” featuring music of Debussy, Scriabin, Liszt, and Bolcom; was released to wide critical acclaim. Other recent solo recordings include “Powerhouse Pianists” on Lumiere, “Concert Music of Fred Hersch” on Naxos, and “Multiplicities: Born in ‘38” on Centaur. Mr. McMillen recently made his Carnegie Hall debut as soloist, under the baton of David Robertson. Pianist Wei-Yi Yang has earned worldwide acclaim for his captivating performances and imaginative programming. 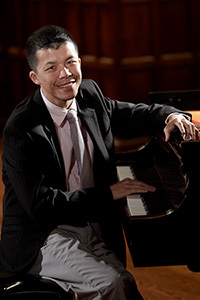 Winner of the gold medal in San Antonio International Piano Competition, he has appeared on the stages of Lincoln Center, the Kennedy Center, and major venues across America, Asia, Europe and Australia. Most recently, he was praised by the New York Times in a “sensational” performance of Messiaen’s Turangalîla-Symphonie at Carnegie Hall. Racing along with our new global society, duoJalal surprises the music world with their diverse and stunning artistry. duoJalal “are fearless seekers and synthesizers of disparate instruments and cultures” raves the Toronto Star. 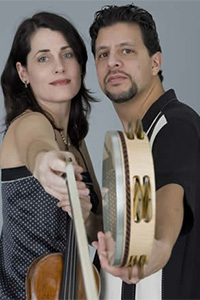 Like the marriage between Kathryn Lockwood and Yousif Sheronick, their music represents an organic amalgam of cultural traditions and musical styles. Audiences are enthralled as a classically trained violist from Australia ignites her instrument with passion - one minute embodying a gypsy violinist, the next a Middle Eastern reed flutist. Yousif, of Lebanese descent, dazzles as he manipulates sound by simply snapping his fingers at the edge of an Egyptian frame drum or dragging his foot across the Peruvian cajon. From their chamber music foundation, duoJalal moves from Classical to Klezmer, Middle Eastern to Jazz, with a skillful confluence that is natural, exploratory and passionate. Inspired by their namesake, 13th century poet Jalal a din Rumi, whose visions and words brought together people of different religions, cultures and races, duoJalal opens their doors to all communities for a diverse and stimulating inter-cultural experience. 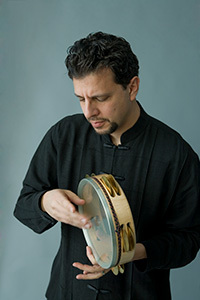 For the past five years duoJalal has performed throughout the United States, Australia and Brazil regularly performing world premiers of works composed or arranged for the group by Philip Glass, Derek Bermel, Kenji Bunch, David Krakauer and Giovanni Sollima. Their latest project “The Rumi Experience” was premiered at the Williams Center in Easton PA. The premier included a new work composed for the “Experience” by Evan Ziporyn and coupled spoken Rumi poetry with each work. duoJalal released their first CD on Innova Recordings titled “A Different World”. Critics hail the CD as an “exhilarating sonic and somewhat mystical experience” (Jordon Times). The Toronto Star exclaims "If this is what the world music's future holds, bring on the party." Always eager to collaborate, the duo also offers two additional programs, one with piano trio and another with dancers. The duo premiered a new work with piano trio in San Antonio TX by composer Jack Stamps and also created a wonderful program with two dancers at UMASS/Amherst.